Vistiors from nearby Montevideo, Buenos Aires and the Brazilian metropoles Rio de Janeiro and Sao Paulo as well as far beyond flocked to Punta del Este in Uruguay to combine GFNY racing with a vacation. GFNY Uruguay more than doubled its registered riders from the inaugural 2016 edition, to over 750 registered riders at the 2017 edition. 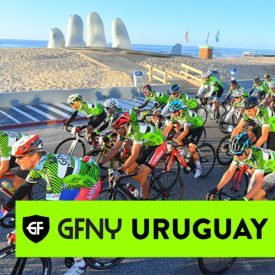 The inaugural GFNY Uruguay was the first mass participation cycling marathon ever held in the country and its growth in the second year proves the increasing popularity of cycling marathons. Punta del Este is well known as one of the major Latin American beach resorts. But it wasn’t all about relaxing and enjoying the late summer sun this Sunday at GFNY Uruguay. Latin America’s bike racers took their summer fitness into this challenging one-day race. The 180km race started and finished in the heart of Punta del Este. After following the South Atlantic shore, the route turned inland where the undulating terrain added up to a formidable challenge: 2000m of climbing. Half way through the race where the riders hit the over-10%-steep climbs, a group of six riders split off the remaining lead group. A fast and flat lead-up to the finish meant it would come down to a sprint finish. Uruguayan Ricardo Guedes edged out countryman Roderyck Asconeguy after 4:35:20. Joaquin Ansolabehere (also Uruguay) rounded out the podium. The women’s race was won in 4:57:40 by 2016 GFNY Championship NYC runner-up Marcella Toldi from Brazil. Flora Meirelles (also Brazil) finished 7 minutes behind her with Uruguayan Johanna Noelia Bracco Olmedo a further 8 minutes back. Next up on the GFNY Calendar is the inaugural GFNY Latin America Championship this Sunday March 26 held at the 2nd annual GFNY Mexico City.